Easy enough to get to – and a lovely place to behold for an amble! From Settle, take the B6479 road up to Horton-in-Ribblesdale (ask a local if you’re too dumb to find it! ), turning right at Stainforth and up the single-track road towards Pen-y-Ghent. Keep yer eyes peeled for Rainscar – you’ve about a mile to go. If you end up at Pen-y-Ghent House you’ve gone past ’em. Turn back for 2-300 yards. It’s on the right-hand side of the road as you’re coming up, about 100 yards up the footpath. “The site consists of a nearly circular bank, about eight feet wide, and in parts two feet high, surrounding a much disturbed area. Within the area are the remains of two cists and a number of hollows that certainly represent other similar structures. The farmer tells of the removal of more than twenty large stones from these hollows, for use as gateposts, wall throughs and drain covers. * The bank encloses an area fifty-four feet east to west…and fifty feet north to south. At the west end there is a smaller bank, roughly in form of a circular apse, extending a further thirty feet. Many large boulders and vast quantities of smaller stone are incorporated in the bank. “Near the east end, with its axis bearing N75E, is a cist — three stones in position. This was cleared to a depth of eighteen inches, and though no floor stone was present, among the sifted soil were found (i) broken bones, including parts of humourus, axis, vertebrae, ulna, ribs and cranium, all human; (ii) five teeth — two molars, one wisdom tooth, and two incisors, which appear to represent tow individuals. Sir Arthur Keith reports that the bones submitted to his examination may represent more than one adult person, and there is also a fragment of a child’s tibia. Most of the limb bones belong to a man of medium stature… He suggests from the condition of the bones a person of the Iron Age. While this is possible with a secondary interment in the area, it is rather unlikely, as all the bones came from within the built cists, and not from the earthen part of the mound, where secondary burials would be expected. “At the west end are two large stones, the side stones of cists or of a chamber. The ground in front of them has been excavated many years ago…and partially refilled with boulders… Within the small extension on the west a trial excavation showed eighteen inches to two feet of random boulders, and beneath them, on the old sub-soil surface, two inches of fine grey sand, with two small flints — one of them a well-worked blade. These probably pre-date the construction of the circle. Recent archaeological analysis has suggested these may be the remains of an old chambered cairn, although there is today far too much damage that’s been done to give us an accurate portrayal of what this originally looked like. The Dawson Close prehistoric settlement is less than half-a-mile further up the ridge. The folklore here is simple: these are the graves of giants who lived in the valley of Littondale in ancient times. 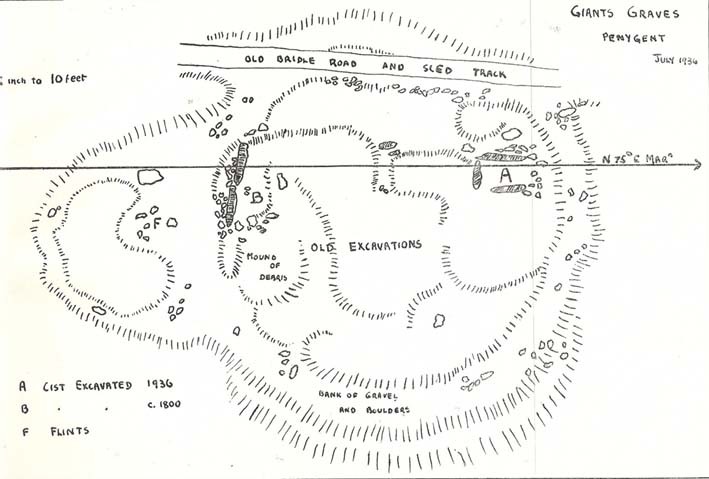 Bennett, Walter, ‘Giants’ Graves, Penyghent,’ in Yorkshire Archaeological Journal, part 131, 1937. Boyd, W. & Shuffrey, W.A., Littondale Past and Present, Richard Jackson: Leeds 1893. Feather, Stuart & Manby, T.G., ‘Prehistoric Chambered Tombs of the Pennines,’ in YAJ 42, 1970. Speight, Harry, The Craven and North-West Yorkshire Highlands, Elliott Stock: London 1892. Whitaker, Thomas Dunham, History and Antiquities of the Deanery of Craven, Joseph Dodgson: Leeds 1878 (3rd edition). * It might be worthwhile exploring the local gateposts and walls to see if any of these covering stones had cup-and-rings carved on them, as was traditional in many parts of Yorkshire and northern England. This entry was posted in Cairns, Tombs, Tumuli, Yorkshire, North and tagged antiquities, Archaeology, Bronze Age, burial, death, folk-lore, folklore, Fountains Fell, Halton Gill, Iron Age, neolithic, North Yorkshire, Pen-y-Ghent, prehistoric sites, sacred sites, Silverdale, Stainforth, tombs, tumuli. Bookmark the permalink. The 1936 excavation produced evidence that the site was a passage grave/multiple cist burial and ascribed to the Neolithic period. Also their are a lange number of what are thought to be Iron age settlement sites within a short distance of the ‘grave’. The base of this former wayside cross stands on the grass verge by the roadway near the gate on the road up from Ribblesdale. It was originally erected as a boundary marker for the estate lands of Fountains Abbey. The best guide to prehistoric sites in the Ribblesdale/Three Peaks region is ‘Beyond the Hill of Winds’, JOURNEYS THROUGH BRIGANTIA volume 4, Aussteiger Publications, J & P Dixon.